The atmosphere is really special. Everyone is there for a common purpose. No-one bats an eyelid if you put on a mantilla (actually, most of the shops sell lots of different types!) Everyone prays. 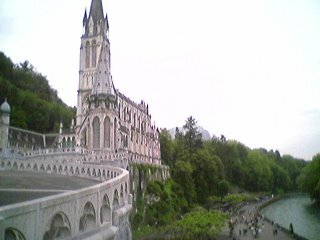 Actually, one of the most incongruous sights was on the last day in the Rosary Basilica: a woman proceded to make her way up the centre aisle on her knees... with a camera clasped in her right hand. And why not! The queues for the women's baths are renowned for their length. One year I queued from 8:15am (the baths open at 9am) and at 11:15am I reached the outer vestibule. Realising that I would be late for the coach to the airport, I reluctantly had to leave. This year, the queues have been more variable. I went on Tuesday morning at about 10:30am, fully expecting the queue to have been closed, but wanting to give it a go. To my surprise, the place was empty, and on my hesitation (I thought maybe it was completely finished) a brancardier shot out and practically dragged me to the door. The rest of the week I had longer to wait, but 2 hours was the longest. At least it gave me time to pray - although you are encouraged to compose your thoughts just before you get down into the water, the combination of a cold wet towel applied to your body just beforehand and water which is so cold you half expect to see icecubes floating in it often leaves you breathless and unable to say more than "Oh God!" 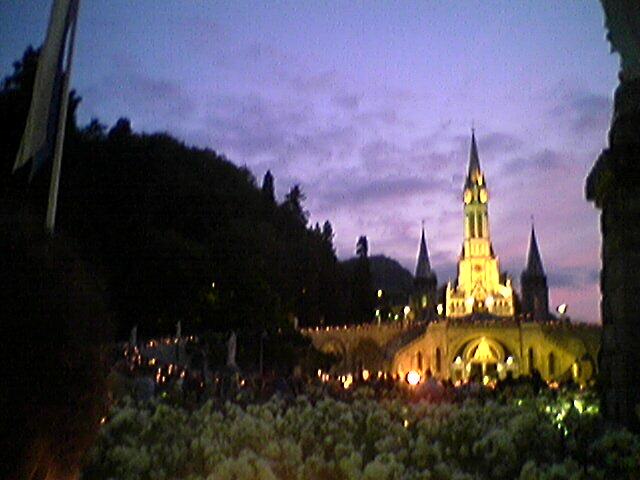 Despite that, it is one of the most moving experiences in Lourdes. It is daunting the first time (and never an "easy" experience, no matter how often you go) and there is a distinct element of penance involved in the mechanics, so to speak, but the feeling you get afterwards is truly indescribable. For a start, although each shop is selling basically the same things, there doesn't appear to be any of the cut-throat rivalry going on - none of the feeling of "we've got the same item as next door, only we're selling two for the price of one, and our one is better anyway, his is rubbish." The shop fronts are completely open, and different shopkeepers can often be seen on the pavements chatting to each other as their respective customers wander round inside. There's a sort of patience involved... there's no feeling that you're being dragged in off the street to visit one shop in particular, it's almost as if it is expected that, sooner or later, you'll end up visiting every shop. This slightly laid-back attitude to browsing is emphasised by the layout of the town itself. There is a one-way system in operation in the streets near the Domaine, and on certain days in the month, the direction of travel is reversed so that everyone has a fair crack at the passing trade! Another reason I don't think of this as commercialism is that the prices are so very reasonable! Having said all this, the shop displays are really something to behold. Bet you didn't realise that the one statue you absolutely had to have was a luminous Virgin Mary. Fr. Tim tells me that he even spotted a statue of Pope Benedict XVI ! Now that's one I have to see! 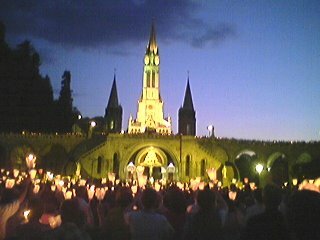 I took the picture at the torchlight procession one evening last year. Taking part in the procession in Lourdes is just such a boost for morale. Everyone is praying the rosary, and there are chants in between each of the decades, and during the choruses, the candles all get held up in the air. There is occasionally a moment of drama as one of the paper shields around the candle flames goes up in smoke, but it all adds to the atmosphere. People are almost always polite and cheerful, putting up with minor inconveniences with good grace, and looking out for each other. It's also really great to see how the sick and disabled are put first... in the USSR there used to be special traffic lanes for the cars of the elite, and in the UK we have special lanes for buses and taxis: well, in Lourdes, there are wheelchair lanes... and believe me, getting run over by a brancardier pulling an invalid buggy is a distinct possibility if you are foolish enough to forget who has right of way!! Sadly, despite the many beautiful places where one could celebrate Mass, there are a handful of rather ghastly locations - mostly in the newer buildings. However, we have arranged to have Mass in the more aesthetically pleasing chapels: Mass on Monday evening after our arrival is in the chapel of St Michael; we're in the Crypt on Tuesday morning, the chapel of St Gabriel on Thursday and in the Grotto itself for Mass on Friday morning. The one blip (as far as I'm concerned) is Wednesday morning, when we join the International Mass in the Pius X Basilica. This Basilica is underground, and can seat 10,000 people or so. Apparently, when it was built, it was considered to be the latest thing, using pre-stressed concrete. The overall effect is one of having Mass in an underground car park. Lately there have been some additions - banners with some of the more modern saints - but it's still a car park. My objections to the location on aesthetic grounds have been firmly ignored: the International Mass is a major event, and as such, it forms part of the pilgrimage experience. To be fair, at least the 10,000 people present actually want to attend Mass, which means that the atmosphere is far better than some of the school Masses I have been forced to attend. I doubt that I shall feel much like hunting for an internet cafe in amongst all the chapels, restaurants and shops selling rosaries and statues. So no more posts until I get back.